Google(s goog) continues to unify Chrome on the desktop and on mobiles with supported new features in the beta of Chrome for Android. The new functionality arrived on Tuesday and is available for developers to create real-time communications apps using the WebRTC API. “It consists of three independent components: getUserMedia, which provides access to the user’s webcam and microphone; PeerConnection, which sets up calls with the ability to traverse NATs and firewalls; and DataChannels, which establishes peer-to-peer data communication between browsers. Google also added Web Audio support in Chrome for Android. 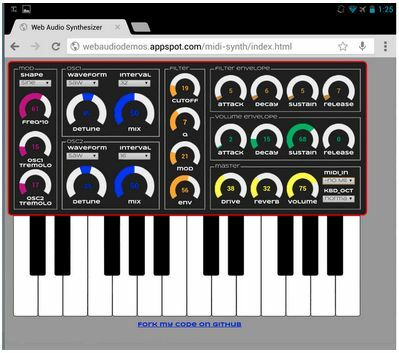 Web apps can be used to process and mix audio tracks such as in this web-based MIDI synthesizer demonstration. It’s actually a fun demo on a touchscreen device such as an Android tablet or a Chromebook Pixel. While demos are fun, it’s up to developers to now take advantage of the new features and APIs to build more capable Chrome apps. Regardless, Google continues to mature Chrome on both the desktop and mobile devices, tying them together with a common set of services. It’s all part of Google’s master plan. I love chome for it’s support of webrtc. Webrtc is very wonderful and can make our webpages live. I have developed two webrtc chat apps, one with webrtc p2p features http://nexwho.com and one with websocket http://chadate.com. The limit of webrtc is lack of mobile support. I believe chrome is working hard on this. Great post! Android App Creation Now on Facebook Fan page https://www.facebook.com/pages/Android-app-creation/638359006176598 Name it they got it!